Among the commonly available stones, only marble has a slight translucency i.e. subsurface scattering that is comparable to that of human skin. It is this translucency that gives a marble sculpture a visual depth beyond its surface and this evokes a certain realism when used for figurative works. Marble also has the advantage that, when first quarried, it is relatively soft and easy to work, refine, and polish. As the finished marble ages, it becomes harder and more durable. Preference to the cheaper and less translucent limestone is based largely on the fineness of marble's grain, which enables the sculptor to render minute detail in a manner not always possible with limestone. In contrast to limestone, marble is also extremely weather-resistant. As a result, surface changes due to the immediate environment are not always visible to the naked eye. This feature can pose challenges when dating ancient works. Marble does not bear handling well as it will absorb skin oils when touched, which leads to yellow brownish staining. While more resistant than limestone it is subject to attack by weak acids, and so performs poorly in outdoor environments subject to acid rain. For severe environments, granite is a more lasting material but one which is far more difficult to work and much less suitable for refined works. Compared to metals such as bronze, furthermore, marble is inflexible and vulnerable to fracturing. This drawback means that sculptors must incorporate specific supporting features into the sculpture to prevent collapse. In Thomas Ridgeway Gould's The West Wind, for example, he poised the figure's short and slender ankles delicately upon the balls of her small feet. 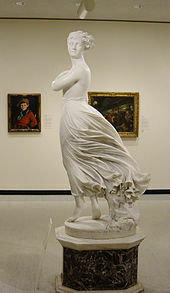 This would not be possible without the deliberate decision by Gould to distribute almost all of the marble's weight to her massive, flowing skirt. Unlike bronze sculpture, this statue is not hollow; her drapery is one solid block of marble. Sculptors usually begin by knocking off, or "pitching," large portions of unwanted stone. A suitable tool for this task is a point chisel, which is a long, hefty piece of steel with a point at one end and a broad striking surface at the other. A pitching tool may also be used at this early stage, which is a wedge-shaped chisel with a broad, flat edge. The pitching tool is useful for splitting the stone and removing large, unwanted chunks. The sculptor may also use a mallet, which is similar to a hammer with a broad, barrel-shaped head. When the mallet connects to the tool, energy is transferred through the tool, shattering the stone. Most sculptors work rhythmically, turning the tool with each blow so that the stone is removed quickly and evenly. This is the "roughing out" stage of the sculpting process. While a mallet provides the force needed to fracture the marble, it must be used accurately. The smallest miscalculation can ruin the intended sculpture and even injure the sculptor. Some artists prefer to carve directly onto the stone, without a model; the Renaissance artist Michelangelo, for example, claimed that his job was to free the human form trapped inside the block. Other artists sculpt a preliminary model out of clay or wax and then translate its features to stone through the use of calipers or a pointing machine. Polishing is the last step of the carving process. Sculptors use a variety of fine, abrasive materials such as sandpaper or emery paper to highlight patterns in the stone and to accentuate its natural sheen. Some sculptors may also use tin oxide to achieve a high-lustre polish. Regardless of the method, however, a glossy marble sculpture will appear more translucent than one that has not been polished. In addition to those hand tools listed above, the marble sculptor uses a variety of hammers – both for the striking of edge tools (chisels and hand drills) and for striking the stone directly (Bocciarda a Martello in Italian, Boucharde in French, Bush Hammer in English). Following the work of the hammer and chisel, the sculptor will sometimes refine the form further through the use of rasps, files and abrasive rubbing stones and/or sandpaper to smooth the surface contours of the form. ^ Margolis, Stanley V. "Authenticating Ancient Marble Sculpture." Scientific American 260, no. 6 (1989): 104-11. ^ For a description of the greater flexibility of bronze sculptures and the ease with which action and extension may be expressed through bronze, see bronze sculpture. Note especially the sculpture Jeté. ^ Fleming, Roland W.; et al. (2004). "Perceiving Translucent Materials". Journal of Vision. 4 (8): 133. Retrieved 29 December 2018.